When journalist Rory Kress met Izzie, she didn't think twice about bringing her home. She found the twelve-week-old wheaten terrier in a pet shop and was handed paperwork showing Izzie had been born in a USDA-licensed breeding facility--so she couldn't be a puppy mill dog, right? But a few years later, as Rory embarked on her own difficult journey to become a mother, her curiosity began to tug at her. Sure, Izzie was her fur baby, but who was her dog's real mother, and where was she now? And where did Izzie pick up her strange personality quirks? Like so many people, Rory had assumed the young puppy was a clean slate when she bought her. Those questions led Rory--with Izzie by her side--on a nationwide investigation, the first of its kind. From a dog livestock auction to the laboratory of one of the world's leading animal behavioral scientists all the way up to the highest echelons of the USDA, they sought answers about who we're trusting to be the watchdogs for our pet dogs. The Doggie in the Window is a story of hope and redemption. It upends the notion that purchased dogs are a safer bet than rescues, examines how internet puppy sales allow customers to get even farther from the truth of dog breeding, and offers fresh insights into one of the oldest bonds known to humanity. 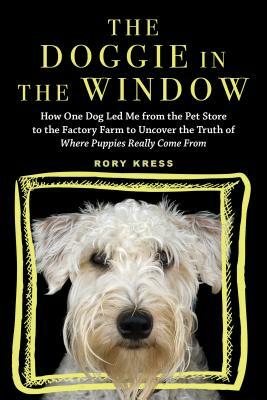 With Izzie's help, we learn the real story behind the dog in the window--and how she got there in the first place.